For the longest of times, we've really wanted to try and find room to put together something on Tim Pope, the director of numerous 1980's Neil Young music videos. For example, the brilliant single take video of "Touch the Night" with Neil as the hapless "action reporter" is almost too real in it's fake newsiness. Tim has a great blog with lots of stories about his video work with a range of clients including Neil Young. i'd made a couple of dodgy videos, as you do, when the phone in our berwick street, london, office rang one day. it was neil young inviting me to make my first american video. this would be 1983, two years into my burgeoning career. i first met neil in person at his ranch, just south of san francisco, when i flew up with his manager elliot roberts. i pitched my idea while neil sat cross-legged and barefoot against the redwoods, slurping on some funny tea. we all reconvened in l.a. and neil arrived in a car that we had chosen from his fabulous collection of over a hundred kept in an aircraft hanger on the ranch's far reaches. this car we were to use in the video. he literally was my first guide around l.a. he physically drove me about the city for three solid days, in a 1950s convertible that resembled a jukebox on wheels and with fins like stilettos. rarely too have i seen a man quaff a burger like [neil] did for comedy effect. as we toured about, stopping at american versions of greasy spoons, gruff, burly, nicotine-y truck drivers in trucks that were clearly extensions of their own manhoods leaned out and asked neil by name if the car was a '56. "that a '56, neil?" "no, a '57." neil young knew everyone in town. to achieve the effect i had sold neil on, i came up with the idea of running the camera at half speed [12 f.p.s.] and doing the playback for neil with the song for him to mime to similarly. though when back to blighty the sound did not go with neil's lips. oh deary me. though after much [jiggery-pokery] in the edit suite, a place called 'visons', next to where the pizza express on dean street is now, we finally got it together, and the nice side effect - a kind of technical glitch - of neil's jerky movements. this is the video you see today, twenty-three years later. Watch Tim Pope's music video "Wonderin'". 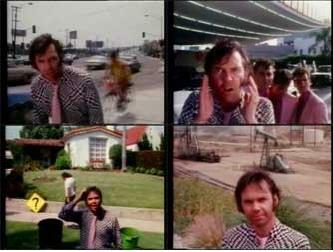 More on Neil Young film and videos. I've never been a really big fan of Neil and the Shocking Pinks or his albums from around that era, but his music videos from back then make me smile. Neil's got this big F*ck You grin on his face and is obviously having fun without a care for what anybody might think of it. Love those videos.Hope they are on Archives #3. What year and make IS the car anyway?Way cool.Bitchin' shirt and tie as well. What do you think of when you look at the cross and the crucifix? Do they hold sacred and religious value for you? conspiracy and divulges the true meaning of the cross—a satanic symbol. church for centuries after Christ." from one of evil to one of goodness? Christ’s death and religion’s role in the change in symbolism.